Hello again Sports Fans, it’s nice to be back sharing inside information with you all about the Arizona fall league. First off I would like to thank my teammates Adrian Cardenas and Sean Doolittle for stepping in and sharing their experiences in the Arizona Fall league with all of you, while I was on my two week hiatus. Secondly I would like to congratulate my hometown Philadelphia Phillies on winning the 2008 World Series. From what I have heard from friends and family and also have seen (Chase Utley) there has been plenty of celebrating in and around Philadelphia. Growing up in the Philadelphia area, being a Phillies, Eagles, Sixers and Flyers fan loads of disappointment has come my way, so it is nice to be able to witness a Philadelphia Sports Championship. Back to the AFL, your Phoenix Desert Dogs are 5 1/2 games up in first place with 10 games left. Well, actually 11 games because an interesting occurrence happened on Friday night while we were playing the Scottsdale Scorpions at Scottsdale. With the temperature dropping into what felt like 30’s or 40’s, the scorpions come to bat in the bottom of the 11th and in the AFL after 11 innings if the score is still tied the game will be called and end in a tie. So with runners on first and second and no outs in the bottom of the 11th the stadium lights decide to completely shut off. This was a humorous event being that the game was already at 4 hour mark and also featured 9 errors, combined between the two teams (So yes, it was not a pretty game). With both teams laughing at the mockery this single game turned into and standing in darkness, our catcher and the scorpions hitter decide to have a “rock, paper, scissors” contest to determine the outcome of the game. Obviously this was just a joke and the game was suspended and will be finished on Wednesday. Everyone knows that we only have about 2 more weeks left until our off season begins and for me this off season is already booked up with weddings, Holidays and even a vacation somewhere in there. But honestly the mood in out locker room is fantastic and nobody wants this Fall League to end. Each and everyday we wake up looking forward to heading to the field and playing the game we love. Although we know that the end is near, this week the desert dogs look forward to playing more baseball and to hopefully clinch a championship berth! Thanks for checking in and I will see you at the Ballpark. 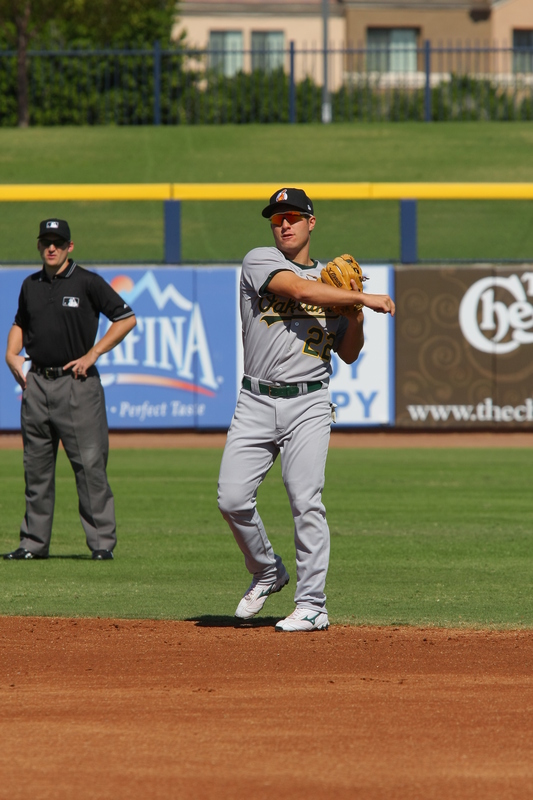 Greetings Arizona Fall League faithful, my name is Sean Doolittle, and I’m guest blogging for Andrew Bailey this week. Apparently he wasn’t getting enough comments as he would have liked so I told him I would step in and show him how it’s done since I have some experience in the blog department for MiLB.com. If my name looks familiar it may be because I wrote a player journal for MiLB this season while playing for the Stockton Ports in the California League and the Midland Rockhounds in the Texas League. For those of you meeting me for the first time I play first base, and I’ll make an occasional appearance in the outfield, just to keep things interesting. I’m from New Jersey – don’t apologize it’s a great state and yes, I like pizza, “cawfee”, “wauder”, I have a “dawg” and I never go to the beach, I always go down to the shore, and I tend to drive a little faster when I’m buzzin’ up and down the turnpike. I played my college ball at the University of Virginia where I studied psychology and was selected by the Oakland Athletics in the 2007 draft. Enough about me, let’s talk about some things you folks out there probably want to hear about. You know all that behind the scenes stuff you guys are dying to get the scoop on. About our team and the other A’s guys and our Halloween escapades and playing baseball deep into November. Yea, we’ll get to all that stuff so read on. We’re just past halfway in this Fall League season and so far it’s been a blast. I’ve played pretty well up to this point, but what I’ll remember most about this experience is how much fun I’ve had playing on this team with this group of guys. Whether it’s playing Halo on Xbox or mixing it up at the field with the guys with one of our countless inside jokes or games it’s always a good time. But once the first pitch is throw its all business. This team definitely has fun playing the game and certainly has played hard enough to position ourselves atop our division. Speaking of fun…let’s talk about Halloween for a little bit. I hope everyone had a safe holiday – yes, it is a holiday – and I hope you had as much fun as we all did. To get as many people incorporated as we could we decided to dress up as a group. With Shane Lindsay dressed up in a massive bull costume and 15 guys dressed up in white pants rolled up to the knee with a red belt and a white shirt we invaded Scottsdale as if we were running from the bulls in Pamplona, Spain. Halloween is all about having fun and being creative…and winning costume contests at Ghost Ball. Sorry about it! As much fun as we’ve been having, it’s going to be interesting playing baseball this late into the fall, outlasting even the Fall Classic. It was awesome, almost motivating, to be playing games and watching the playoffs unfold everyday after we were done for the day. It helped having my hometown club go all the way and get the ring, but it was also pretty cool to see guys that have played in this league now playing in October when it counts. Although one of the best parts about this league is the high caliber of competition you see every day. And if that doesn’t get you ready to play, you might want to check your pulse. I enjoyed talking with you and this cameo’s been great. Hopefully “Bails” took some notes and the comments will start rolling in. As for me I’m looking forward to some cooler weather and hoping to wrap up this Fall League season on a good note and get on back to the Right Coast for the winter and maybe see some snow and hit up Atlantic City. You guys have been great!